When two gruesome murder videos appear on a social-media site, Lucifer and Chloe deduce they have a serial killer on their hands. 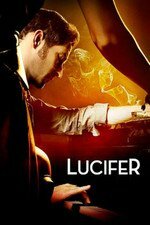 Meanwhile, Lucifer's mother tries to understand his life on Earth, and Amenadiel struggles with his loss of power. *Dan tells Chloe he thinks they should get divorced. *Lucifer reconciles his promise to God by giving his mother the punishment of hell on Earth, living the human life of Charlotte. *In an encounter with a mugger, Charlotte discovers she has some super-human powers after all. And we're back to case-of-the-week stuff again. It was fine, I guess, but outside of some table setting (mom stuck on earth--do we even know if dad will accept that as a suitable punishment?) it didn't really feel like it moved the story forward. I just want the show to do something. Anything. I guess since dead-Charlotte was a lawyer they'll be able to fit Mother-Charlotte into the case-of-the-week plots now too. I suppose seeing how she interacts with Chloe could be interesting, but I'd be more interested in a Lucifer family group counseling session with Dr. Linda. The punishment envy was a bit over the top even for this show and it seemed a smidge out of character for the cop to basically ignore the threats by Lucy. Looking like the nice smart shrink may just have a little bit too much fun at some point. Also as much as the juggling of the "rules of the world/angles" is part of the fun it seemed odd that the "mother of angels" would not know the rules gave her super strength or would be surprised. If she's never spent time as a human, I'm not sure why she would know this. She's written as having really no clue at all about humanity so it seems like she's never taken human form and probably didn't care to find out much about what it would be like if she did. .However, it's odd that Lucy didn't suspect she did since he still has powers in human form as does Amenadiel (losing them now, but certainly had them initially).